These are a few of the items I've knitted for family and self. Quite a few others have been grown out of and gone into the charity bags over the years. Knitted with 100% New Zealand wool, Wool Pak 10 ply. This photo doesn't capture the intricacy of the Aran pattern, so we'll be replacing it sometime with a photo taken when the contrast is not so great. 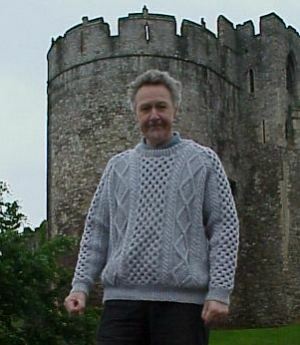 Here my brother-in-law wears his Aran-style jersey outside Chepstow Castle, Wales. Although the stitches are Aran, the yarn is 12-ply rather than true Aran (10-ply). The colour is 'silver' and the yarn is 100% wool by Bendigo Wools. I knitted this in Australia. It was high summer in Australia but fortunately I found a good spot to sit right under an air-conditioning outlet while knitting. I had a lot of fun knitting this during spare time at work and hope some of the people who stopped to admire my progress will enjoy this picture of the finished result. One of the boys decided that they wanted me to knit them a sheep. 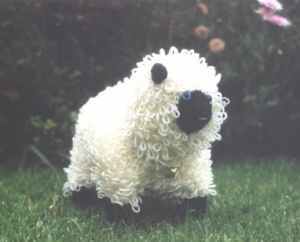 So here, from an old Jarol pattern, is the blue-eyed sheep. She is knitted from a variety of New Zealand and Australian worsted 8-ply wools. She wears a bell around her neck and has a store-bought nose. Her body is stuffed with white synthetic toy stuffing, her feet and muzzle with dark 'knee-highs' so no stuffing of contrasting colour shows through. 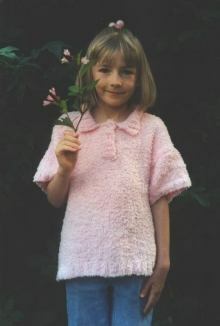 This top is knitted in Sirdar Snowflake, which makes a wonderfully soft, stretchy, fluffy fabric. I don't like using synthetic yarns, because I knit with a high tension and need the elasticity of wool if I am not to get sore hands, but Tara loves this top. The buttons are little pink sheep that she chose herself. While I was knitting this top, Elroy asked for a pillowcase knitted from the same yarn, so I ended up knitting fluffy pillowcases for him and for Gene. Elroy's is pale blue while Gene's is bright yellow! It had never occurred to me that a fluffy pillowcase might be nice, but in fact they are very comfortable. This was my first attempt at an Aran. I'd used double knit (8 ply) exclusively for years, partly because I could use leftovers for intarsia sections of the next jersey or else for making Jean Greenhowe's toy designs. But I fell in love with the texture of Aran jerseys. This one is a King Cole pattern - that had a mistake in it, which I had to figure out and correct. I used a wonderful 100% wool Aran yarn from Bendigo Wools. I lengthened the arms a bit too because everyone in our family has long arms and arm length is often the first thing we grow out of. 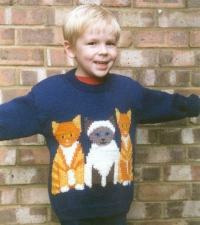 Martin selected the pattern and the yarn colour himself. 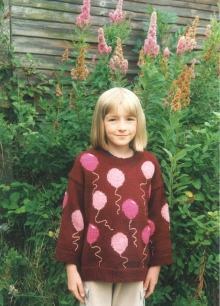 This pattern appeared in the Fall '96 issue of Family Circle Knitting, in which it was a dark green jersey with deep pink balloons. Green is not really Tara's colour so I did it in deep red instead. I decided to have balloons of two different colours because I wasn't sure I had enough wool to do them all in one, but when Tara wore it to school one of her friends, quite unaware that the original pattern was for balloons of all one colour, told her that it would have been a boring jersey with just one colour of balloon but as it is, is really interesting! The yarns are all 100% wool, double knit (worsted weight), but are a variety of brands from New Zealand and Australia. The main colour is Clan Stewart 8 Ply. The strings are Thorobred and at least one of the pinks is Cleckheaton; I'm not sure about the other. Well that's what he calls it! 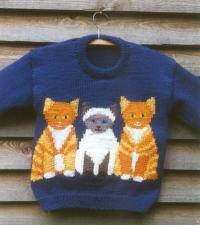 The intarsia template is from a book by Val Love, but in her book the kitties were all ginger and had black-and-white eyes. The middle one did not have stripes. I have changed the middle kitty to a Siamese and given them all eye colours. This is a very busy intarsia pattern; at one stage I counted up my bobbins and found I had 30 in use! The facial features were added later. The whole jersey is in 100% DK wool. The dark blue is Clan Stewart 8 Ply, a wonderfully soft, elastic wool from New Zealand. The kitties are a mix of Australian and New Zealand 8 Ply Crepes. 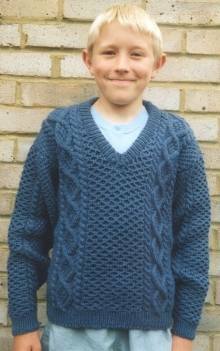 In these pictures it is hot off the needles and still a couple of sizes too big but hey, he'll grow into it, and at the time I finished it we were within weeks of travelling to a Southern Hemisphere spring. This pattern was a free giveaway if I ordered a Mary Maxim catalogue. 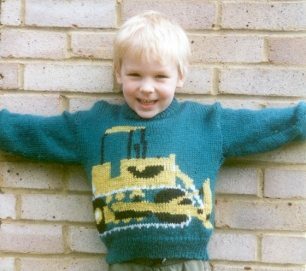 It was supposed to be done by intarsia, but I found the treads and other little details so fiddly by intarsia that I put the bulldozer on afterwards by Swiss darning instead. Like just about everything I do, it is 100% wool. The main colour is Thorobred 8 Ply Crepe in a lovely blue-green shade. The grey is Glen Mist 8 Ply Crepe. I'm not sure about the black or the yellow. 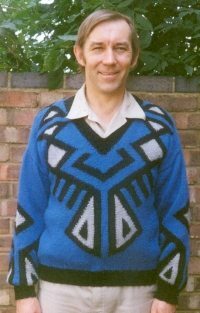 This is a double knit (8 ply, worsted weight) jersey. I knitted it in the biggest size to get a big, cuddly, oversized effect. The pattern is a Sirdar one but as usual I blissfully disregarded the yarn recommendations and knitted it in a New Zealand wool yarn, Shepherd Glen Mist 8 Ply Crepe. Those complex cables were so much fun! I knitted this while attending the MidAmerica Toxicology course, even knitting it at lunchtimes in my hotel room, and still vividly remember realizing halfway through one afternoon lecture session that I still had my cable needle behind my ear! This is a very rare instance of me actually using the recommended yarn! 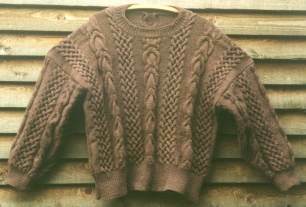 This is the jersey from the cover of the Fall '94 issue of Family Circle Knitting, with one colour substitution, taupe to gold, because the taupe had been discontinued. A very easy pattern in a really luxurious, if rather expensive, yarn, Classic Elite Montera which is a llama/wool blend, a delight to knit and makes a wonderfully light, soft finished product. Makes the wearer very cuddly! A nice warm garment too; I tried it on to check. I had just finished it when this photo was taken. When I finished Wes' jersey I had heaps of that expensive yarn left over, so I asked Wes if he'd like a hat or mittens to match. 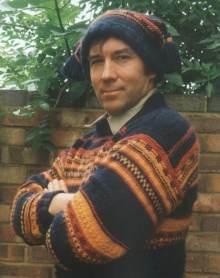 He opted for a hat and took a liking to a whimsical tasseled hat in the Fall '97 issue of Family Circle Knitting. It was a different yarn, different gauge, different pattern...but no big deal to adapt since it is simply a rectangular hat with tassels on the corners. More than eleven years old when this photo was taken, and still looking good! It had a quick de-pilling (its first, I believe) before this photo was taken. 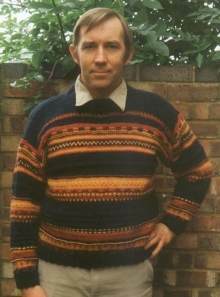 This was from a kit made by a company in Napier, New Zealand, and is knitted from their 100% Perendale wool. The pattern is really symmetrical, Wes must have been wearing it a little crooked when this photo was taken. Most likely he had something in his chest pocket. I'm not the only one who thinks the pattern is reminiscent of a Native American bird motif. I finished this while Wes was studying for his Commercial Pilot's Licence. He wore it to the Aero Club and his instructor took one look at it and roared "What's up Dalefield? Are you trying to drop hints or something?" Coming soon: A new Aran jersey for Martin, he is outgrowing the one above.